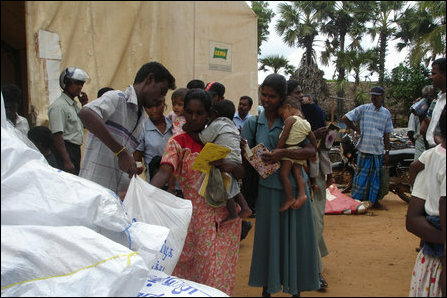 Internally Displaced persons in Vanni who were receiving the humanitarian supplies sent by the people of Tamil Nadu, while expressing their gratitude for the timely help, urged the leaders of Tamil Nadu to help them to win their freedom by voicing for the political aspirations of Eezham Tamils. TamilNet correspondent recorded expressions from the IDPs who were gathered at Karaichchi Multi-Purpose Cooperative Society, one of 23 supply centres in Vanni, on Thursday. The IDP families in Vanni were receiving humanitarian supplies sent from Tamil Nadu, through the co-operative societies with active monitoring by the ICRC. Vananthan Prema, a 27-year-old mother of three children aged 8, 2½ and 9 months, displaced first to Jeyapuram and then to Aanaivizhunthaan, Mu'rippu and now living in a makeshift camp in Kaddaikkaadu said, described the plight of her baby struggling without milk. 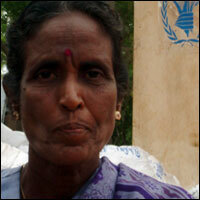 "Earlier, I managed to feed my children by doing chores in houses, but now it is impossible to find any work here." 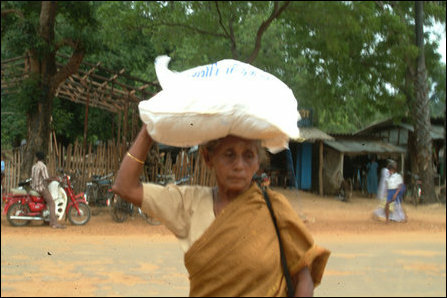 She had to rely upon the lentils she got in the World Food Program (WFP) humanitarian ration to feed her elder children. One of them got ill being fed only on lentils, she said. "I do not have the money to take them to the hospital. I cannot breast feed my child and our life in the makeshift camp is miserable with the continuing rain and floods making everything drenched in water," Prema told TamilNet correspondent. Murugesu Thavarajah, an IDP who received humanitarian supplies for his family, said he had lost his properties many times in the war. "Every time, after losing our places and properties, we build our lives again from the scratch," he said. What was different this time was that the people of Tamil Nadu, from all the corners of their state, with a clear understanding of the intention of the Rajapaksa regime, said Thavarajah. "From the common people of Tamil Nadu who joined hands in the human chain, amid heavy rains, to the poets and cinema artists, the entire Tamil Nadu has realised the real picture of the Rajapaksa regime," he said. "The Tamil Nadu people should continue to struggle forward till they win the recognition for Eezham cause, I am sure they will succeed," he added. The Sri Lankan government had only allowed 50 lorries carrying relief packages sent by the people of Tamil Nadu to reach Ki'linochchi district. Officials said that the supplies that have reached them were adequate to cover immediate relief requirements of 40,000 IDP families in Vanni. At least 51,200 families, comprising more than 230,000 individuals, are in need of urgent aid, according to the officials. The officials were forced to prioritise families with children on Thursday. "We thank the people of Tamil Nadu, Chief Minister Kalaignar Karunanidhi and all the other leaders for their generosity," Rasamani, an elderly woman displaced from Uriththirapuram on October 18 due to intense artillery shelling, said. "We hope that a better future will dawn with their help," she added. The distribution of the relief packages began Thursday in 23 branches of the Multi Purpose Cooperative Society (MPCS) in Ka'ndaava'lai Assistant Government Agent (AGA) division in Ki'linochchi district. The first distribution began around 8:30 a.m. Thursday in the branch of Karaichchi MPCS located near Tharmapuram No.1 School. 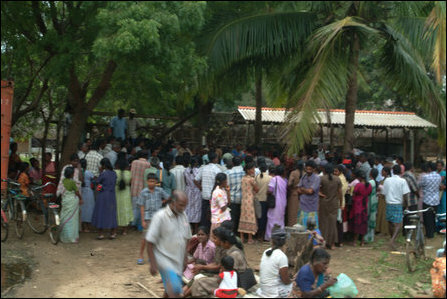 People displaced due to Sri Lanka military offensives, and staying in temporary shelters, had gathered in large numbers at the cooperative retail shops as early as 5:00 a.m.
Thavarathinam Kamalahasan, 32, a day labourer displaced from Mallaavi to Tharmapuram due to the bombardment by the SLA and the SLAF expressed his gratitude to the people of Tamil Nadu for the relief food. He complained that the World Food Program (WFP) supplies that didn't reach them on time for many weeks, were inadequate to meet the demand, but said the supplies from India was a great relief for the time being. 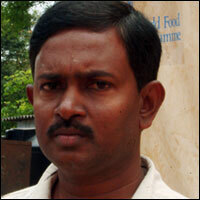 "600 gram rice, 500 gram flour and 300 gm lentils were the only food relief items that we got earlier. We received it irregularly in bulks as the supplies were not allowed to reach Vanni on regular basis," he said. 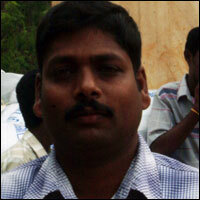 "The food packages from there sent on 15 November have reached us only now. 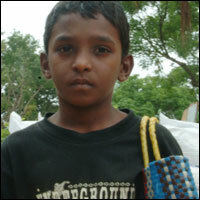 The clothes sent by the people of Tamil Nadu are yet to reach us. The few clothes that we had, been washed away in the recent floods and we hope that the clothes sent to us from Tamil Nadu will reach us soon," Kamlahasan who is presently living in Kaddaikkadu after being displaced from Mallaavi first and from Kanthapuram and Ki'linochchi said. Representatives of the International Committee of Red Cross (ICRC) and the ICRC Economical Relief Branch officer Mr. Harry Mewa Chilaffia visited the cooperative branches to ensure orderly distribution of the limited relief food that was allowed in by the Sri Lankan government. Hundreds of IDPs, including the singles who had lost their family members, had to return empty handed after waiting for hours. The IDPs who did not receive relief registered complaints with the ICRC. 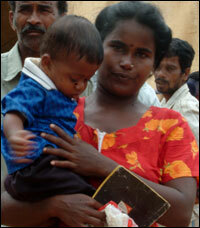 05.12.08 'Thanks for food, but help to win our rights,' Van..
26.11.08 Relief supplies from Tamil Nadu still not reached ..